Last year, as Phase Two of the Marvel Cinematic Universe (MCU) came to a close with “Ant-Man” a new template was established. That being, Marvel Studios/Disney giving lesser-known (to the general public) Marvel Comics superhero characters a chance to headline their own movie on the heels of a blockbuster that offers more of a “sure thing” like “Avengers“, or a recognizable property that’s a guaranteed draw. It’s their way of expanding what they’re building, offering a third tier supporting character from the comics and delivering a movie that leans toward a certain genre that veers from straight-up spandex. “Ant-Man” was essentially a heist comedy and now we have “Doctor Strange” from director Scott Derrickson, which is out to bring dense mysticism and dizzying visual effects to delight and subvert our expectations. For the most part, it succeeds due to those elements and the help of a game cast, but it’s also a movie that’s limited by some of the very machinations Marvel has previously used, ultimately delivering a story with an inescapable familiarity that offers more of the same. If you’re cool with that and just want to see Another Marvel Movie, then this movie is for you. Now, before those who’ve seen it opening weekend and raved about it on social media get all bent out of shape, I’ll tell you straight-up – that’s not a knock, but the screenplay by Derrickson, Spaihts and C. Robert Cargill is undeniably familiar to the MCU, with its origin story about the downfall of a brilliant and arrogant prick as well as what the characters do and how they behave in the movie. No amount of kaleidoscope visual effects can hide that. Although I take issue with that aspect of the movie, I can’t deny that it didn’t work. For the record, I’d see “Doctor Strange” again, probably in 3D too, knowing full well it’s an entertaining movie, despite its formulaic elements. It’s not quite clear where or when Dr. Stephen Strange resides in the MCU in “Doctor Strange”. Although he was mentioned in “Captain America: Winter Soldier” a couple years ago, which would suggest that HYDRA knows about the Sorcerer Supreme (or else why else would he be mentioned? ), but this movie contains his origin, so it’s unclear if it takes place before “Winter Soldier”. I suppose it shouldn’t matter, but if producer Kevin Feige wants to be meticulous in his Easter Egg droppings, he should at least try to be thorough. After a beheading, er – an opening in Kathmandu, Nepal, which vaguely introduces us to a determined, pony tail-wearing Mads Mikkelsen (it’s safe to assume he’s The Bad Guy of the movie, thanks to Micheal Giacchino’s ominous score and the fact that the beheader was one of his acolytes – and, well, he’s Mads!) who tears out a page from an ancient book in a secret, not-so-well-guarded location. After the hooded/robed owner of the book chases the thief and his horde through a portal, out into a modern-day cityscape where buildings bend and contort to the will of these sorcerers, we’re soon transported to New York City. This is where we meet Dr. Stephen Strange (Benedict Cumberbatch, wrestling with an American accent), a talented and arrogant neurosurgeon whose mind and hands work in harmonious concert to save lives in the operating room. he may have risky methods, but he’s impeccable at his job. He regards his colleagues, such as Dr. West (Michael Stuhlbarg) and his former flame, ER nurse Christine Palmer (Rachel McAdams), with dismissive condescension. Strange’s self-absorbed ego exasperates anyone he encounters, even those who truly know him. For a protagonist like this, it’s only a matter of time before he’s brought down a few notches to provide a lesson in humility in order to help him see what a prick he’s been. This observation is immediate and is just the beginning of a storyline will be quite familiar to viewers, especially ones who’ve seen prior Marvel Studios movies. Tragedy strikes when Strange gets in a horrible car accident while driving to a gala (he happens to be taking a bluetooth call AND swiping through some medical files – pay attention, there’s an Easter Egg here – on his tablet, which may make this the first Marvel Studios movie with its own PSA, but I’m not keeping track), leaving his hands wrecked behind repair. Any surgeon or artist will tell you just how devastating this would be. When Strange awakens in his hospital bed, he is horrified at the pins and screws that have reassembled his mangled hands, stating to Christine that he could’ve done better after she reassures him the doctors did the best they could. After multiple surgeries, he still isn’t able to continue his profession. He’s not quite found any humility yet either – in fact, he becomes more and more of an annoying jerk, what with the way he rudely disposes of Christine. If anything, his crippled condition makes him more of an arrogant SOB – so, what it’s going to take for this guy to see who he truly is and what he needs? Well, in his search for various forms of rehabilitation, Strange follows a rumor about a local paraplegic Jonathan Pangborn (Benjamin Bratt), who learned how to heal himself completely and walk again with the help of the Ancient One. Determined to follow the same path, Strange sets off on a journey to a desolate location in Nepal, home to the world of the mystic arts, a place that which will change his life and purpose forever. It’s here where he meets the Ancient One (a very invested Tilda Swinton), a bald Celtic woman, who serves as mentor to all who reside in the secret compound called Kamar-Taj. 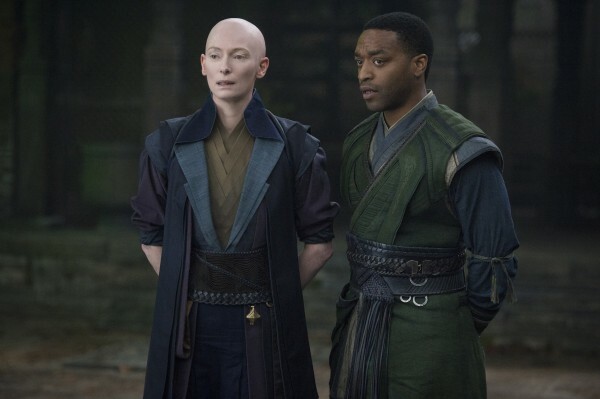 This Sorcerer Supreme has a right hand man in former pupil, Baron Mordo (Chiwetel Ejiofor), who finds Strange and sees him as someone who could possibly defend the secrets of the Mystic Arts from potential attackers. Confused and skeptical at first, the pragmatic Strange pleads with the Ancient One to teach him the ways of the Dark Arts after she exposes him to the astral plane and multiple dimensions, such as the Mirror Dimension. 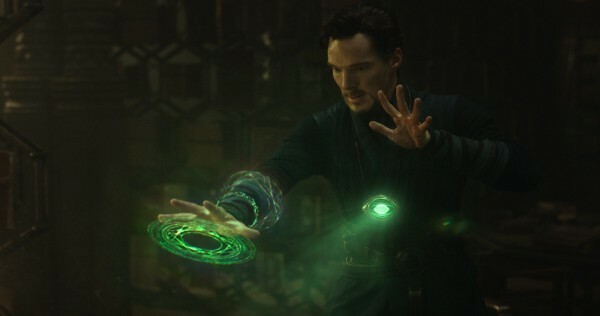 A quick learner, Strange manipulates spells, opens portals and learns how to steal sacred books from under the watchful eye of Wong (a funny and stoic Benedict Wong) a humorless librarian. 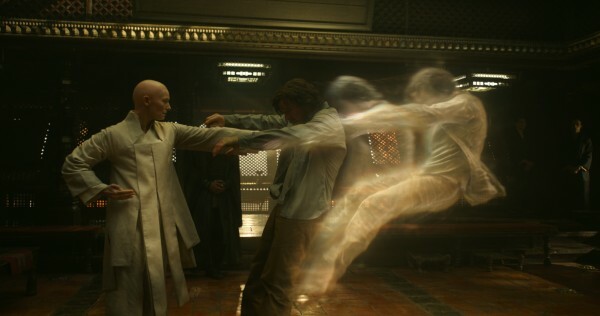 When the three buildings, the sorcerers are sworn to protect, locating in New York, London and Tokyo are threatening by former Ancient One student, Kaecilius (Mikkelsen) and his minions, Strange and Mordo must team-up to defend these Sanctums and prevent the summoning of the dreaded Dormammu from the Dark Dimension. Along the way, Mordo’s loyalty to the Ancient One will be tested and Strange, who is still learning to manipulate his newfound skills and abilities, must use his analytical and resourceful mind to defeat his foes. Did you follow all that hocus pocus mumbo jumbo? Well, what you probably found is a very standard superhero formula here. 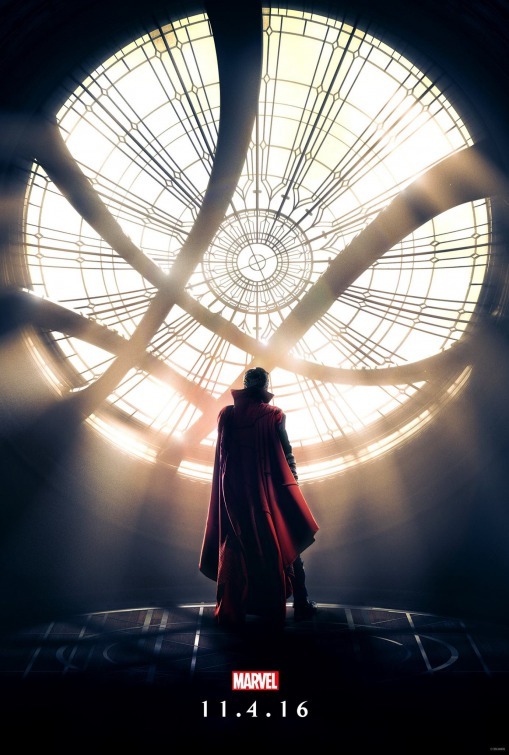 We may have come a long and – well, strange (sorry – had to) way – since “Iron Man“, which started all this back in 2008, but there’s no getting around the familiarity of the storyline in “Doctor Strange”, which lacks a semblance of unpredictability. Just as “Iron Man” introduced us to Tony Stark, another egotistical eccentric – who, like Strange, is also very skilled yet is quite hindered by his own ego and hubris. The difference is Stark’s incorrigible charm is unquestionable (something we expected from Robert Downey, Jr. and why he was perfect for the role), but Stephen Strange is awfully exasperating to be around. Sure, Derrickson and Cargill’s script add some humor to the character’s know-it-all attitude, but ultimately it’s hard to root for someone this much of a pompous jerk. At the end of the movie, he’s a pompous hero instead of a jerk and I’m just hoping he becomes the go-to guy for magical problems in future movies, the same way he is in the comics. That’s why Feige and company held out for Cumberbatch, who comes with undeniable charm and charisma, even if his character doesn’t. That’s right, for a while there, names like Joaquin Phoenix and Patrick Dempsey popped up as potential Sorcerer Supremes. They were wise to wait for Cumberbatch’s schedule opened up. He has a good handle on the role (even if he reminded me of Hugh Laurie’s Dr. House at times) and although I’ve grown weary of origin stories, I understand this is a Marvel character unfamiliar to the masses. Therefore, introductions are in order, so this approach makes sense. 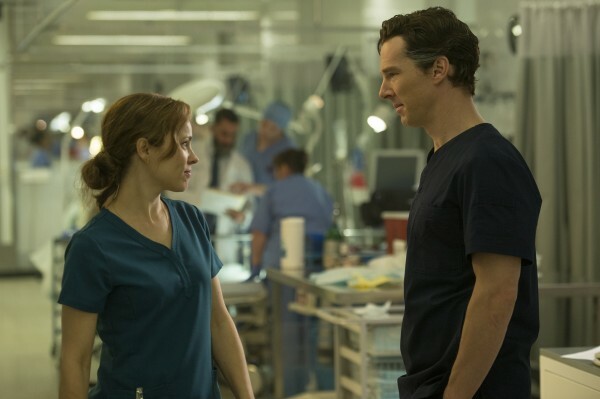 Still, I found myself wishing we were already watching Cumberbatch’s Dr. Strange mastering the Mystic Arts already, mostly because I know how intriguing and odd the Steve Ditto-created character has been in the comics and I wanted to just get there already. The rest of the cast is really good. Any time you have Swinton, Ejiofor and Mikkelsen appearing in a film, it’s worth your time. All three deliver solid work here, but their characters can’t hold a candle to their talent. They’re having fun, but in this movie, more than any other Marvel movie, it feels like there are actors here who deserve better material. 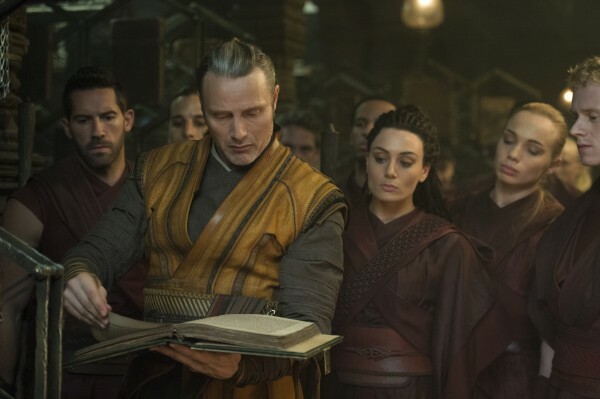 Mikkelsen’s Kaecilius (a name that’s hard to remember, much less pronounce) is the character that’s the most blandly conceived. His motivations and actions are predictable and far from unique, except for the fact that he’s convinced he’s doing good, which is always a welcome perspective for a villain. Still, Kaecilius supports the complaints that many MCU villains are kind of lame and unmemorable. There’s an attempt to use McAdams’ Christine to ground Strange to the real world, but the character just winds up being another underutilized female supporting role that is relegated to that of a confused observer. There’s a complaint that many of these big-budget blockbuster movies have the same ending – some kind of floating menace above a city that threatens the existence of mankind, etc and so on. “Doctor Strange” has that too, but I like what was done with it actually. I won’t spoil it, but there’s a fun twist that adds a clever action sequence to the ending and it’s also fun to see Strange using his resourcefulness to outsmart his way out of peril. 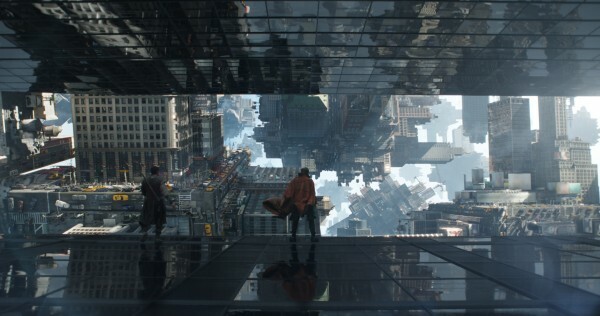 So, as much as the story in “Doctor Strange” is familiar, the movie will be remembered for its visuals. They are admittedly dazzling and cool to behold, with the “Inception“- style bending and folding of buildings and multi-dimensional traipising, but I found myself longing for something trippier. Again, this is because I know how artists have added surreal and weird elements to the comic. I didn’t just want the obvious M.C. Escher inspired designs, I wanted more of a Salvador Dali feel, but I suppose that might’ve been too trippy for the masses. Another aspect of the visuals that stands out here is the costume design by Alexandra Byrne, who worked on both “Avengers” movies, as well as “Thor” and “Guardians of the Galaxy“. She does stellar work here, bringing a practicality to the robes worn by most of the sorcerers here and makes the Cloak of Levitation (a humorous sentient here) and the Eye of Agamotto (an Infinity Stone here), two trademark adornments, fit nicely with Strange’s wardrobe. I find myself a little surprised to be admiring the ornate fabric and meticulous folds of the costumes in a superhero movie. Some had felt that Marvel Studios bringing Strange to the big-screen was risky. That makes me chuckle. As if bringing the space-gods of Asgard, a sci-fi pulpy WWII adventure and a sarcastic talking raccoon with a one-line walking tree, wasn’t risky! I say they had already successfully crossed that risky rainbow bridge when they released “Thor”. That’s right, if it wasn’t for that movie embracing and balancing an odd mix of outlandish multi-worlds and deliberate humor, “Doctor Strange” wouldn’t be possible. It’s only fitting then that a certain God of Thunder appears in one (of two) end credit scene. Dr. 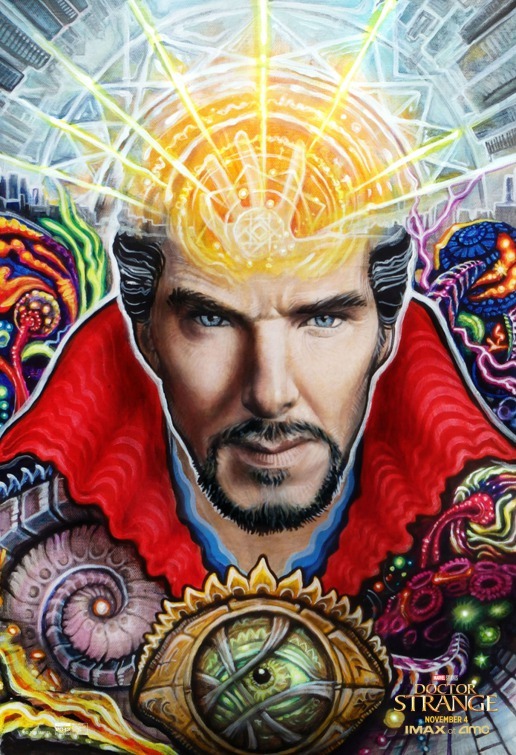 Strange became an integral always been of the Marvel Universe in the comics, offering a connection to the real world and the many outlandish dimensions only he can comprehend. Other superheroes would go to him for help, which would often provide some of the best stories. Cumberbatch’s Strange will show up again in future “Avengers” movies as well as his own sequel and I hope he has the same odd, sage-like presence that always made him his welcome appearances fun and strange in the comics. I don’t read the comics, so I had idea what I was getting ready to see. And I somehow never saw a preview. All I knew was that it was another Marvel movie and that Benedict was in it. I very much enjoyed it, saw it it 3d and glad I did! As you say, it was formulaic, but really, that’s what I want in a marvel movie. It was maybe, not quite as well done as some of the others as far as fleshing out and digging into the psych of the characters, but still very enjoyable.